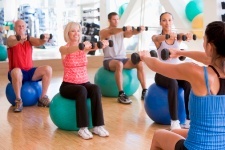 Home » General Health » Does It Matter How Intense Your Workout Is? Does It Matter How Intense Your Workout Is? When it comes to exercise, any kind of activity will do. As long as you are using your muscles, your cardiovascular system, and your nervous system, you’re bound to exert a beneficial effect on your body. That means that walking four blocks to get a pint of milk instead of taking the car counts as exercise. So does taking the dog for a walk or using the stairs to get to the sixth floor at work rather than taking the elevator. All of these small efforts add up over the course of a day, to give your body a pretty decent workout. But do you ever wonder if you should be doing more? Do you really need to up the ante a bit and go for a run or maybe do a stint on the new exercise machines at the gym? Would this extra sweat and effort make a big difference to your health overall? The short answer to that is: “yes.” But before you get discouraged and think you have to go out to run a marathon in order to be really healthy, consider the results of a study conducted at Taipei Medical University in Taiwan. Researchers conducted an unusual clinical trial that involved banking and insurance workers. These workers are the kinds of people most likely to be trapped in jobs that keep them sitting at a desk for long periods of inactivity while at the same time being under considerable stress due to deadlines and job performance expectations. The researchers developed a three-month exercise program that was aimed at reducing worker “burnout” and cases of metabolic syndrome. Now here’s the good news: levels of burnout, fatigue, and incidences of metabolic syndrome significantly improved in both the low and high intensity exercise groups. So, even a low level of exercise is good for you! You can improve your blood pressure, reduce your waistline, and keep your mind from getting overloaded—at least to some degree. For those who can find the motivation, however, increasing the intensity of your exercise will boost your blood pressure outcomes even more. Based on the researchers’ findings, this added intensity could contribute to the good health of your heart over the long term. Tsai, H.H., et al., “The Effects of Exercise Program on Burnout and Metabolic Syndrome Components in Banking and Insurance Workers,” Ind Health. March 22, 2013.